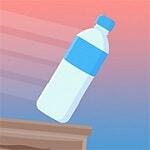 Throw a bottle of water in the Bottle Flip so that it landed straight to the bottom and rises on a movable platform. Collect the stars and open new bottles. There are 2 game modes: the classic game and the game on time.